Brown Rot: Blossom infections from the brown rot fungus can occur whenever pistils are exposed and a favorable climate exists. Infections can occur during any wetting period when temperatures are between 41 and 86 ° F. However optimum conditions for infection occur with wetting and temperatures in the mid 70’s. During long wetting periods (several days or more) blossoms can be infected regardless of temperature. Generally infections that occur when conditions are sub optimal are less severe. Blossoms and fruitlets will remain susceptible until the pistil dessicates (sometime between petal fall and shuck split). Oriental Fruit Moth: A biofix point for OFM has not yet been set in NJ, but will be probably be set early next week. The first insecticides for first generation Oriental Fruit Moth control should be applied at 170-200 degree days after biofix. This timing generally coincides with petal fall in peaches, however this year it may be closer to shuck split. Do not apply insecticides until all petals have fallen to minimize bee risk. Bacterial Spot: Copper formulations should be used starting at petal fall to suppress bacterial spot. Generally we recommend starting at 0.5 ozs metallic copper and gradually lowering the rate as the season progresses. The rate applied will depend on the formulation. Dr. Lalancette published a chart listing common copper formulations and rates for peach and nectarine applications. Avoid combining copper with captan especially if it has been overcast for several days, or if applying rates higher than .5 ozs. metallic copper. Also avoid acidic spray solutions when applying copper. Peach Scab: In addition to Rusty Spot and Bacterial Spot, peach scab requires protective applications starting at Petal Fall. Topsin, Topsin/Captan combinations, Gem (now called Flint Extra), Inspire Super, and especially Quadris Top are the best materials for blocks that had scab last year. Both Gem and Topsin should be used at the high rate to deactivate overwintering lesions on the wood. Quadris Top contains azoxystrobin (Abound), which is phytotoxic to many apple varieties. Phytotoxic residues can remain in the tank for long periods after an application is made, even if a tank cleaner is used. Do not use Quadris Top or Abound in the same sprayer used for apples. Rusty Spot: An effective material should be included at petal fall, and continue through 2nd cover on rusty spot sensitive varieties. Rally at 2.5 – 5 oz./acre is the longtime standard. Other effective materials include Gem, Inspire Super, and Quadris Top. Both Gem and Quadris top will control all diseases at petal fall. Do not use Quadris Top or Abound in the same sprayer used for apples. European Apple Sawfly (EAS): This insect is active through bloom and into petal fall and first cover. Adult females lay eggs just under the skin of freshly set fruit, and the young larvae mine just under the skin. Where this insect is active, it is a primary target at petal fall. In orchards of mixed variety plantings, the petal fall spray for the entire planting is prolonged. This enables EAS to start damaging the first varieties where petals fell earlier before a petal fall spray could be applied to the entire block. Diseases: Apple Scab, Powdery Mildew, Cedar Apple Rust, are diseases of concern at this time. The NEWA scab models are estimating about 35% ascospore maturity during this period in southern NJ. Northern counties will have less ascospore maturity. Primary apple scab spores are released during any substantial infection period. We are entering peak ascospore discharge so keep covered at appropriate intervals. At tight cluster include products effective for powdery mildew and cedar apple rust. Cranberry Weevil: Up until this past week our weevil counts were especially low. During the week ending 4/14 we sampled 81 fields, with an average weevil count of 0.001 per bush and a maximum of 0.1 per bush. For the week ending 4/21 we sampled 51 fields, with an average weevil count of 0.135 per bush and a maximum of 5.3 per bush. 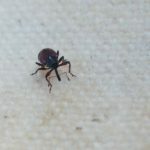 The treatment threshold for cranberry weevil is 5 weevils per bush. Since the weevil activity took a while to progress, and bloom is coming on fast, few options are available to treat at this time unless you are in northern counties. The chart below summarizes recommended materials that can be used for weevil control with suggested wait times before bees are brought into the fields. based on label statements and natural enemy data from: Roubos et al. 2014 Relative toxicity and residual activity of insecticides used in blueberry pest management: Mortality of natural enemies. Jour Econ Ent. 107(1):277-285. Bloom and Pollination: Flowers are starting to open up as commercial beekeepers bring hives into the fields. Some farms in Atlantic County already have hives in place, and bees are due in Burlington County by next week. Because of the timing and movement of bees into the fields the time for pre-bloom insecticide applications is over. The next insecticides will be applied just after the bees come out in 3-4 weeks. Plum Curculio (PC): A few pyramid traps are up and visual scouting is taking place. However no PC adults have been seen as of this writing. With weather predicted to warm up next week, we should start to see plenty of PC activity. Growers are cautioned that insecticides cannot be used until the bees come out. PC will be the first insect target for the first post pollination spray. Phomopsis: Phomopsis overwinters in bark and on canes. Spores infect leaves and shoots in early spring with wetting and temperatures at 40-45 deg F. Sprays targeting phomopsis should initiated at budbreak and continued up to berry set. See the NJ Commercial Grape Pest Control Recommendations for recommended materials and rates. Grape Flea Beetle; Climbing Cutworm: Flea beetles are active on Warm spring days especially near wood lines. Flea beetles cause damage by chewing holes in developing buds and leaves. Climbing cutworms overwinter in trashy groundcover such as old leaves and weed debris. They climb vines at night and like flea beetle chew on developing leaves and buds. Cutworms are not a common pest in NJ but may be sometimes found. Scouting for both of these easily controlled pests is recommended before applying insecticides. See the NJ Commercial Grape Pest Control Recommendations for recommended materials and rates.